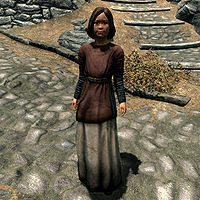 Braith is a Redguard child, and the daughter of Amren and Saffir living in Whiterun. The family is clearly dysfunctional, with Saffir buried in books all day long and Amren worrying about nothing but his lost family sword. As a result, the lonely Braith has turned into the local bully, her favorite target being Lars Battle-Born. During the related quest, you will help Lars get rid of his bully, and find out Braith's true intentions. The family lives in Amren's House in the Wind District of Whiterun and Braith sleeps in her room on the second floor every night between 9pm and 9am. Immediately after waking up, Braith leaves the house and spends three hours fooling around with the other children of Whiterun, until she returns home at noon. At 3pm she exits the house again, this time for four hours of playing. The last two hours are spent inside the house, eating, relaxing, or trying to communicate with her distracted parents. She wears child's clothes and a pair of shoes. She carries her house key, a selection of food and toys, and a small amount of gold. You can see her walking around town with a chip on her shoulder, saying: "Boys, girls, dogs, elders - there's nobody I won't fight!" She will make it apparent that she not intimidated by you when she remarks: "What're you lookin' at? I'm not afraid of you, ya know. Even if you are my elder." Braith: "Battle-Born! Give me your money!" Lars: "I... I don't have any money." Braith: "You'd better give me five septims, right now, or I'm going to bloody your nose..."
Lars: "No! Please! I really don't have any money, Braith! I'll give you ten septims tomorrow. Just don't hit me." Braith: "Ten septims tomorrow, baby Battle-Born. Or I'm gonna bloody your nose and your lip." Braith: "Oh look, it's little baby Battle-Born." Lars: "Leave me alone, Braith..."
Braith: "What are you gonna do if I don't? Huh? Gonna cry to your papa?" Lars: "Braith. I.... I've come to tell you that I'm not afraid of you anymore." Braith: "Don't make me laugh, baby Battle-Born. You'll be afraid of me till the day I kill you." Lars: "You... You're wrong! You can't hurt me anymore..."
Braith: "Oh no? So you're gonna fight back if I punch you? Huh? You're gonna hit a girl?" Lars: "Well, no... I... I mean..."
Braith: "That's what I thought. Now get out of my way, baby. I got things to do." She will then proceed with her daily routine, playing with Mila Valentia and even Lars, until it is time to go back inside her home, where her mother resides, always with her nose in a book. If you locate Lars, he will state the obvious right away: "It's no fun getting pushed around all the time..." If you ask him if he is having trouble, he will lighten up and make you an offer: "Yes. Braith bullies me all the time. All the elders think I'm a milk drinker 'cause I can't fight. Nobody understands. If you can get Braith to leave me alone, I'll be your best friend... forever! I'll pay you, too! My whole life's savings - two septims!" When you accept, the related quest will initiate. Back in the house, Braith will randomly attempt to make a connection with her distracted mother, but will find no help. She will also be keen on talking about her victim, but even then, Saffir will not even look up from her book. "Not now, Braith. Go... go ask your father." 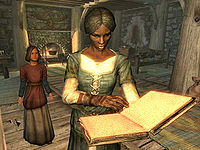 When approached, Saffir openly complains about her daughter, claiming: "My daughter Braith says I read too much. 'Play with me, mother!' Girls need to learn how to take care of themselves." and will continue on with: "Really, I wish my girl would read more. It would certainly keep her out of all those fights." Lars Battle-Born will also try and communicate with his family, although most of them will call him a milk-drinker because he can't fight. His grandmother Bergritte will try and solve the problem, telling Lars: "It's that Braith girl again, isn't it? Has she been bothering you again? I've a mind to speak with her mother." and Lars will immediately say: "No! Please, grandmother, don't do that. I'm fine. Really. Can we just... not talk about this anymore?" "Why don't you talk to your mother about this, okay?" All three choices will lead to the same response, and a rather surprising one at that: "Okay, okay! I'll leave him alone! I was just kidding around. Besides, if he'd only kiss me, I wouldn't have to beat him up all the time..." She will then walk away, leaving you no choice but return to Lars Battle-Born who will greet you with: "I don't know what you did, but Braith won't even look at me now! So thanks!" Braith, on the other hand, will never receive her kiss and will only say: "I don't fight Lars no more, if that's what you're worried about." Bullying Braith: Convince Braith to stop bullying Lars. Your adoptedHF girls may complain about her: "Braith is a big meanie. She keeps telling Lars'n me what to do. I don't wanna play with her anymore." If Saffir is dead, Amren will change his last response during conversation to: "I wish your mother were still alive. She could answer you much better. Let me think on it and we'll talk later." 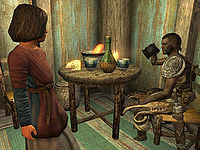 In the game, during the opening conversation with Lars, Braith will say: "You'd better give me five septims, right now, or I'm going to bloody your nose... Ten septims tomorrow, baby Battle-Born. Or I'm gonna bloody your nose and your lip. 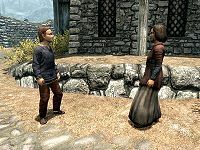 ", making Braith undecided on the amount of septims she wants. The conversation was supposed to play out as shown above.